When our guide for the day told us that the pickup back to the hotel was at 9.30 pm, I had my sincere doubts if the kids would last that long. He was leaving us at the Hong Kong Disneyland. It was 10.00 am in the morning. The 9.30 pm pickup otherwise made sense as there are fireworks at 9.00 pm. But I made a note of the taxi stand anyway. I knew I would need it, negotiating the metro with two cranky kids and my sense of direction didn’t feel appealing even at the start of the day. When my daughter got her passport this year, I was probably more excited than her! I wanted to take her and my niece out, who already had a passport. What better place than Disneyland for the kids, or so I thought. 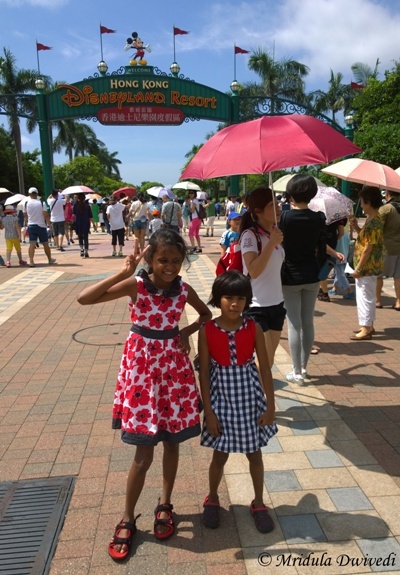 It was a hot and humid Sunday when we visited the Hong Kong Disneyland. I know that was nobody’s fault that the day was hot. It was also a Sunday. It was a long weekend back in India. It was school holiday time in Hong Kong too. So, it was everyone’s idea of fun, to head out to the Disneyland on that Sunday! From the coach parking to the entrance was a short walk. Anyway, both the kids are good at walking, walking was least of my worries. We saw the Disney characters at the entrance, there was a long queue in case you wanted to get photographed with Mickey. My kids said they would give it a miss. The queue looked daunting. We stumbled into the area called Tomorrowland. The first ride we saw had a 50 minute wait. 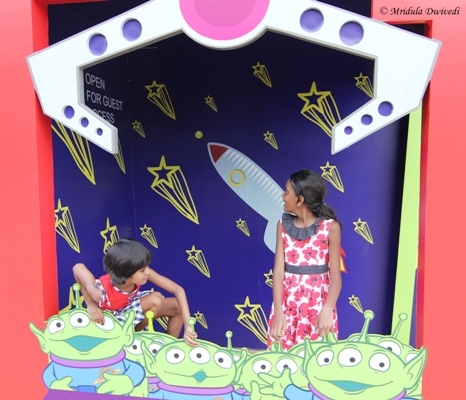 I chicken out, we walked into a ride called Buzz Lightyear Astro Blaster. It had a shorter wait, it was indoors too, which meant air conditioning. The attendants at the ride advised me to sit with Chhavi as each car has two seats. My niece Vasu is big enough to sit alone. We go along the track with guns in our hands trying to blast Zurg and everything else in-between. The kids laughed and I was happy. We come out to the same ride I overlooked earlier, the Orbitron. The kids want to go, they say they don’t mind the wait. I quickly decided that I would let them handle the rides and wait period. If they were happy to wait, I was happy to wait. At the entrance, the staff politely informed us that the wait was 50 minutes. I thanked them and we got into the queue. The queue was orderly, surprisingly the kids were well behaved, all the kids I mean. There was hardly anyone telling mom and dad that they wanted to do it right now! We went up in the same car this time as it could seat 4, when our turn came. My niece fiddled with a nob and our car went up, then she made it come down! It was fun while it lasted, for about 5 minutes. It was a 50 minute wait for a 5 minute ride! By now we had been out in the sun for more than an hour. The kids were thirsty, they were hungry too. There was a restaurant nearby. Only there was hardly any place to sit. We anyway placed our orders of ice creams and cold drinks and managed to find a seat. The kids polished off the ice cream and told me that they would walk with the drink. I agree. We stumbled on to the Fantasyland next. We stood in a queue for the Cinderella Carousel. The wait time was about 20 minutes, which meant the ride was not too popular. 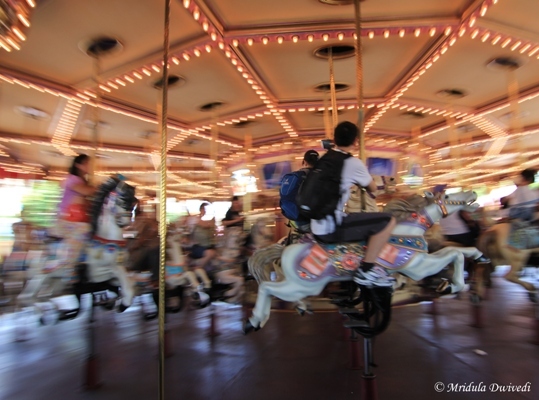 My daughter said she has done such merry go rounds before. Well, this one looks a lot more posh but she had a point, the basic idea was the same. The kids left the cold drink aside saying they could not finish it. Food was 3 times more expensive in Disneyland compared to the rest of the Hong Kong. I paid in dollars (OK Hong Kong Dollars but still) to buy it and here were two brats leaving it aside! I don’t like cold drinks at all so I could not finish it off for them! You can only bring in water from outside to the park. No outside food is allowed. 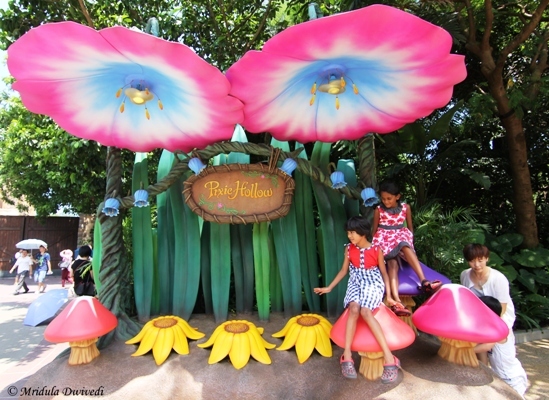 After this, my niece spotted a ride called- Dumbo the Flying Elephant. It had a wait of 60 minute and it was a much smaller version of the Orbitron. I tried to dissuade her but she was firm. So Dumbo the flying elephant it was after a wait for 60 minutes. I forgave her in the end because I saw really grown up ladies in their saris (from India too as we chatted later) enjoying the ride after standing in the queue, my niece is after all 9 years old! We then went in to see a show called ‘Mickey’s Philhar Magic’. It had a very short wait time, it was in 3D, it was in an air conditioned hall. It was a lot of fun, particularly the AC. By now not only the kids, even I was hungry. We went into the restaurant called the Royal Pavilion. We ordered pasta and drinks. By now I was ordering a little less. I decided I could always buy more stuff but I didn’t wish to see my dollars going waste! I had a minor altercation with Chhavi and the lady at the counter offered both the kids stickers to distract them! That was mighty nice of her. And that is the only Disney merchandise they got! We sat outside in the shade as there was no vacant seat in the air conditioned hall. It was quite nice actually in the shade. Later with some food inside our stomachs we decided to give the Toy Story Land a try. My niece was attracted by the RC Racer Roller Coaster. My daughter was below the height restriction. I asked the staff if I could let my niece go alone and they said that was perfectly fine. So off went Vasu, while Chhavi and I waited at the exit for her to comeback. It was a long wait in the hot sun again, there were a few umbrellas that offered some shade. Chhavi asked me to go inside a shop after waiting for a long time. She said she wanted to be in the AC for a while. She told me she would not ask me to buy something from the shop. I was fidgety inside the shop, what if Vasu came out? So we got out of the shop and within two minutes Vasu came saying she was looking for us! She had fun on that ride, it actually looked like a lot of fun to me too. But then I could under no circumstances leave Chhavi and Vasu alone and go! They would bring half the Disneyland down in that time. 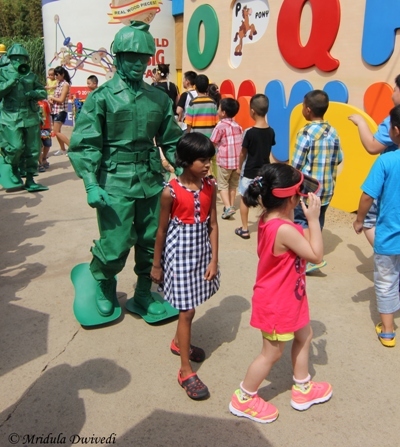 While we were walking around Chhavi went and attended the toy soldier boot camp! She looked totally clueless and cute! The actors helped her along and ensured that she had a good time. We then headed for the Toy Solider Para-shoot Drop. It again had a wait time of an hour! By now it was 4.00 pm in the evening and the kids told me that after this ride they wanted to go to the hotel! 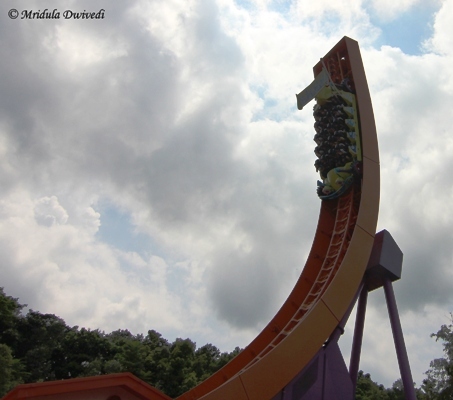 In this ride you sit in the ‘para shoots’ and drop from a height, go up again and get dropped again a few times. It was mildly exciting for me. 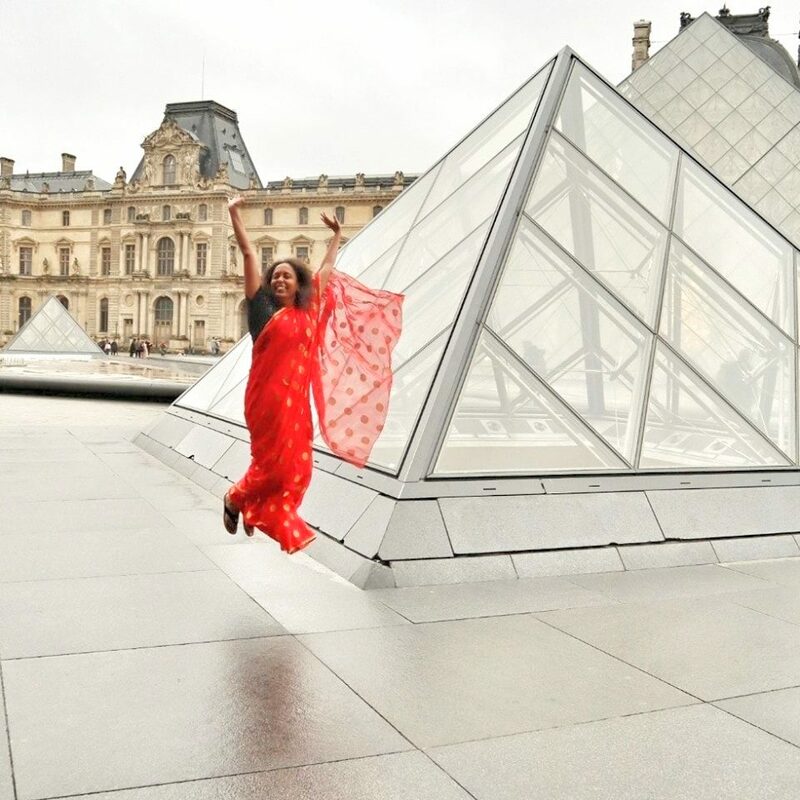 But for Chhavi it was dreadfully exciting. Her face would contort when the fall came. 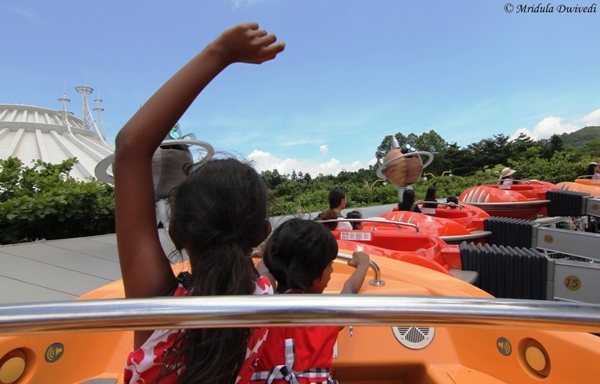 After getting out of the ride she started- “now if only we had brought papa along, he would have screamed louder than me!” Till she went for this ride, she hardly ever remembered her papa but now suddenly she kept chanting it for the next hour! He is wise though, he refused to venture with two kids to a foreign land! I asked them if they wanted to sit in air conditioning and eat something and give other rides a try later? Both firmly refused, I guess it was all a bit too much for them. We headed out to the taxi stand and soon we were on our way to the Royal View Hotel. The hotel was quite close by, 20 minutes ride at the most. The kids later told me that they would give only 5 out of 10 stars to Disneyland as they had to wait for every ride in the hot sun. If you are planning to go to Disneyland Hong Kong do take a look at the temperature. Also if you can, do not go on a public holiday as every other ride will have about 1 hour wait time. Be aware of height restrictions. The food will cost more! Overall I think the kids did have fun. It was anyway quite educative for them, the ads of Disneyland and the actual experience did not match up! As we say in our family, it was indeed a character building exercise! It was fun indeed Anita now if only the queues were shorter! 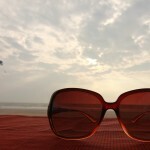 Yes Indrani but the next time I will plan for less sun and not on a public holiday! That was Four times the Fun! Ha ha but we want cooler weather and smaller queues next time. Avinash I would actually not go to Disneyland if it was not for the troubling kids! A wonderful trip and such fun shots. Yes Mahesh but quite exhausting in the hot weather. Nice honest account. I felt how exhaustive it might have been! 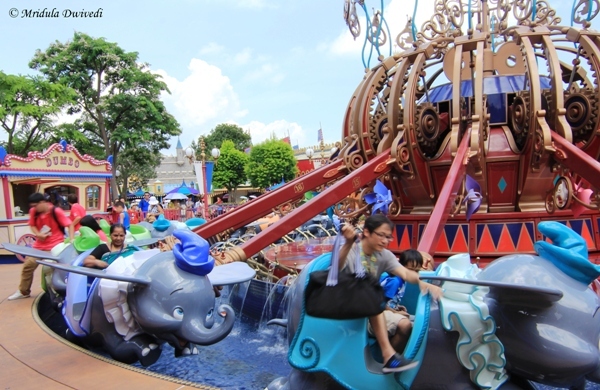 Nice account of hongkong disneyland. Long waits for the rides though!! Yes Priyanka, I should have expected the long queues but I didn’t!